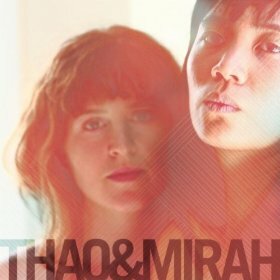 Careening from freak folk to R&B to funk and back again, Thao (Nguyen of Thao with the Get Down Stay Down) and Mirah (Yom Tov Zeitlyn) have crafted an album that is deeply listenable despite itself. If you think that the opening Merrill Garbus (aka tUnE yArDs) produced track Eleven would set the tone of the album, you’d be as wrong as you are right. As soon as that explosion of everything-going-on-at-once-but-it-still-makes-sense ends, the duo launches into Folks, which is exactly what you think it is …a folk song. That back and forth runs the course of the record and as a result, the whole thing doesn’t come together as a cohesive unit as well as one would want it to. But who cares about the sum when the individual parts are this good? Rubies and Rock sports an ominous yet danceable groove that you would expect to find in the top 40. And that’s before the horns come. The very next track, Teeth, seemingly abandons the pop polish in favor of a lo-fi sound full of hand /knee claps. But by the time it has built to the chorus of ”Next time I swear more hope less fail,” the song has managed to erupt all over the place with a giant swell of strings, timpani’s and voices joining in to drive the heartache of this breakup song home. On the track How Dare You, the two come together in a somewhat hilarious dialogue about the realities of post-breakup relationships. The track’s playfulness is tempered by a restrained groove that constantly threatens to open the song up into a full-on funk number that never comes. It adds emotional weight to the bittersweet subject matter and provides the highpoint of an album that already has a good number of highs. All said and done, this is an album made up of really great singles that are just to the left of what you would expect from a duo like this. There’s a lot to pay attention to here and a lot of reward…if you are looking for it. If not, what you have are a pretty great collection of pop songs that will please just about everyone. Either way, it’s an album that you should pick up and just have FUN with, which is something you won’t often hear me say. But in this case, it’s what the album was built for. Check out the groups upcoming tour dates below.